Vacation rental cottage. Sleeps 8, 3 bedrooms, 1 bathroom. No pets allowed. A cabin with the best Tahoe has to offer. Convenient in town location but with a feeling of peace and quiet rarely found this close to all that Tahoe has to offer. Located just minutes from skiing at Heavenly, boating and playing on Lake Tahoe, dining at one of the many restaurants on Ski Run Blvd. 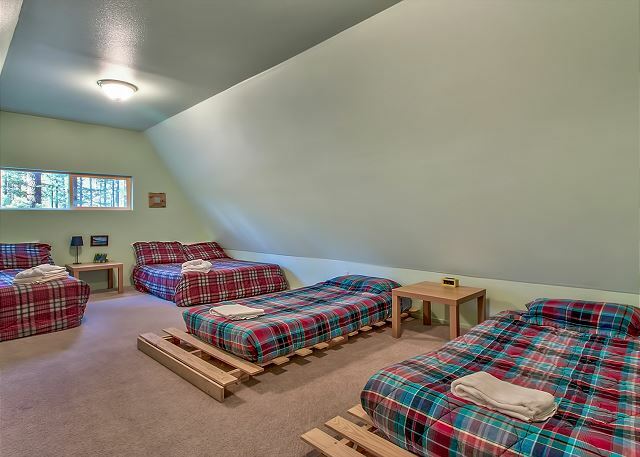 The Tahoe Pines cabin backs to acres of open space and is adjacent to the bike trails. This is a perfect location for exploring the meadow, walking to Bijou Park ( disc golf, kids play area, BMX bike track and more) and enjoy the beautiful fresh mountain air. This three bedroom cabin features a sunny living room with gas fireplace, kitchen, dining area, full bath and one bedroom downstairs. Upstairs are two more roomy bedrooms with vaulted ceilings. On the back deck facing the meadows there is a hot tub, this is the perfect spot to relax after a day of skiing, hiking or playing in Lake Tahoe. The owners describe it best: It’s an oasis of serenity for us. In winter, the kids enjoy playing in the snow, especially with the big hill in the backyard by the trail. During the summer, they enjoy the woods and playing outside. The home was nice. The only two negatives of the home where. The bedrooms had cabinets with broken drawers they weren’t useable to store clothes in. In the pictures they showed a washer and dryer. Which were in the garage but they weren’t accessible the garage was locked. I called the agency on Sunday evening and I couldn’t get a hold of the realtor. Thank you for the notes, I looked back through our photos and did not find any photos of the washer dryer, this home has never had access to the washer and dryer I am afraid. We are on the phones 24/7 but when town is full many calls are dropped and cell service is impacted. I do apologize if we didn't answer for you. The house was super clean and everything was easy to find, even the Wi-Fi password and keys. We didn't use the hot tub but it looked nice. Parking was an issue but there wasnt much anyone could do about that. My only complaint is there were mouse droppings in the kitchen around the sink and stove and the microwave didnt work. We tried to find a breaker box to see if that would help but couldn't. Otherwise, it was a pleasant stay. Property was clean, I would have preferred a more private yard for the hottub, but not a deal breaker. Very narrow steep stairs were probably the biggest downfall. Not many kitchen "staples" like seasonings, oil etc. But overall a nice stay and luckily the only people who had to go up and down the stairs were teenagers. We had 7 people for a birthday weekend. The privacy the house offered was amazing but was also so close to everything. The hot tub worked and was such a relief after a long day hiking. I saw comments on the stairs and honestly we are all young to middle aged adults and the stairs didnt bother us a bit. The rental company was more than helpful and so easy to reach when we had questions. We stayed here with our 2 young daughters and their grandparents in July. The best thing about the cabin is being able to sit on the deck and in the hot tub and enjoy the view of the woods. We also enjoyed being able to go for a bike ride on a short paved path behind the cabin and a walk through the nearby meadow without getting in the car. The bedrooms upstairs were very spacious, but the living area was very small and only had seating for 3-4 people so it would be really crowded with a larger group in the winter. The cabin is not well maintained (drawers missing or loose upstairs, window hardware coming loose, bathtub with dents, lightbulbs missing, roof tiles coming off). It would have been much nicer if these issues were addressed. Lastly, a bear broke into the cabin at 2am through a bathroom window, so if you stay here lock all doors and windows at night and when you leave the house. You definitely had a trip the girls will always remember. Thank you for the feedback, we will address issues with the homeowners. Bears have been a big issue this summer in Tahoe, more than we have ever seen in town.